Happy fall, everyone! The fall equinox began this Saturday, September 22, and it sure is feeling like fall out there, isn’t it? Fall here on Pogo is always pretty fun and I get to give you a little preview of what’s to come here on Pogo this season. We kicked it all off just a tad early on Sept 18 with the new Magic Marathon and then continued the celebration on Saturday with the PogoFest Marathon! But there’s even more coming your way soon! Let’s start with a Sneak Peek at Tumble Bees. Pogoians, if you’ve not yet seen our Sneak Peek of Tri-Peaks HD, please click here and you can see it now! I love it and really hope you do, too. And now on to Tumble Bees HD! As you may already know, Tumble Bees HD will be arriving on Pogo on October 9. 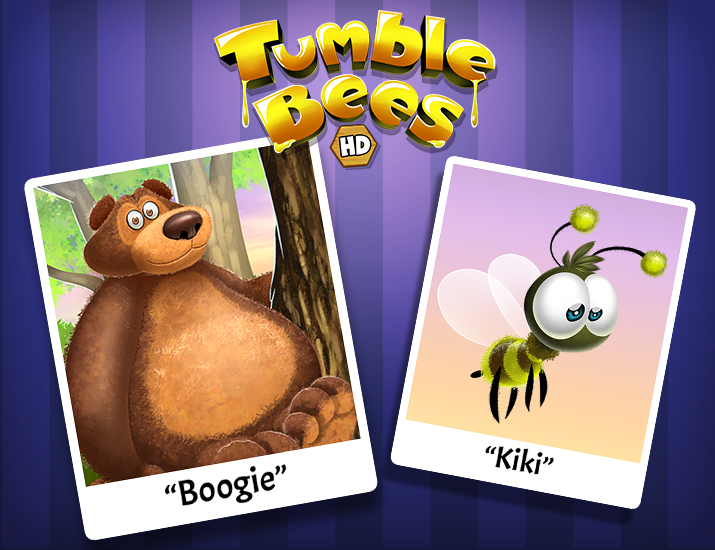 Here’s a Sneak Peek at a few of the beloved Tumble Bees characters, Boogie Bear and Kiki! October Game of the Month – Solitaire Gardens. Claire Hart 2: Secret in the Shadows Badge Marathon – Slated for October 3. Get ready to dig down deep and investigate with Claire! Another New Challenge – A unique new Challenge is coming soon- we’ll be giving out more details in the next Pogo Insider! Jewel Academy – New levels slated for October. 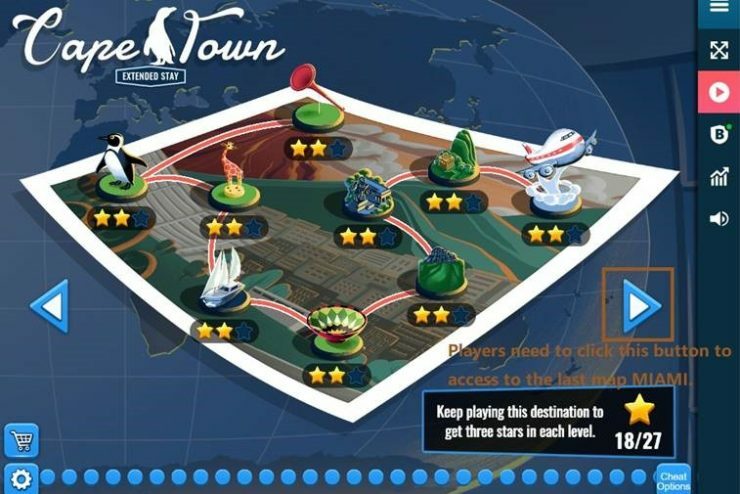 Jet Set Solitaire – We love just how excited players are about this game – which is why we’re focused on adding more and more fun locations to the game! But as we’ve done that, the map has become, well, a bit too crowded! (Don’t worry, they’re working on updating that and a few other things – details coming soon!). So, with the update release going out on October 9, players will not be able to access the first map of San Francisco and the last map of Miami by using the dot at the bottom of the screen. Instead, players must use the arrows to access all of the maps. Thank you for your attention to this matter. Please see images for reference. Poppit! HD – Two more days – September 27! (As with Word Whomp HD, we pushed this release another few days later by virtue of the Tournament for the Flash version). Tumble Bees HD – Slated for October 9. Claire Hart Classic – Slated for November. With Claire Hart Classic, all of the episodes that you have purchased in the Flash version of Claire Hart: Soul Searcher will be owned by you in Claire Hart Classic! We’ll be giving you more details as the release date approaches. Word Whomp HD – The team became aware of an issue in which players were experiencing slow and sluggish in-game movements while playing Word Whomp HD on the Microsoft Edge browser. The issue was worked on and has now been resolved. You may now enjoy fast and smooth game-play in Word Whomp HD using Microsoft Edge. Pogo Expressions – Token pricing has been removed as of today and any Expression which previously had a token price attached to it is now free! Tokens in the current Flash and Java games will remain and will not be removed. Thank you for your understanding. Stay tuned for more information about the upcoming system for Challenges- I will be giving you details via the Pogo Insider Blog over time so you’ll all be in the loop. September Mini Mall update: Our next scheduled release in the Mini Mall will combine some Fall and Halloween Minis on October 4, 2018! Keep your eyes peeled for those. We also have a few special Mini items coming your way; a Poppit! Party t-shirt will be out on 9/27 along with a free animated Poppit background, and we have some super-cute Lottso Express HD Minis coming out in October, too! We’ll give you the specific date for the Lottso Minis a little later. Pogo Terry – aka Capn’ Pinchers -has joined us in the Pogo Insider studios for a Q&A about Poppit! HD, which will be available on Thursday of this week. Pogo Terry: Well thank you for having me, Pogo Llama. And hello Pogo Community! (Waves). Poppit! has a long legacy here at Pogo and Spike is a well-known cherished character here. So instead of completely re-designing a classic that helped define Pogo, we wanted to focus on setting Poppit! HD apart with some upgrades to make the game even more memorable and fun. Besides being upgraded to work with HTML5 web browsers, some improvements include: a super fun new loading screen that is more in theme with the game itself than it was before. We’ve also replaced the older looking pop-up tutorial with a modern interactive tutorial. This new tutorial gives you the option to skip and permanently opt out of as well, as we know many of you folks are seasoned Poppit! pros. ). Plus, we brought the graphics up-to-date and improved the themes that Club Pogo members can unlock when they rank up. It’s also possible for us to now add even more themes to the game down the road, too. There is even a special secret holiday theme that all players will get for FREE later this year. So much to look, see ,and do going forward! Just looking at the new version of Poppit! HD….it looks more vibrant and colorful now. Pogo Terry: Poppit! HD will have the same pin and weight power-ups as before. While we researched the potential to add new power-ups, it would essentially require redesigning the original gameplay around these new mechanics and risk making it a different game than the original. The main goal of Poppit! HD was to upgrade it for HTML 5 browsers, improve the graphics and themes, and give it some quality of life improvements while keeping that same classic gameplay. Pogo Llama: I think our players will agree they appreciate keeping the original gameplay! I have a question for you, now. What was it like working on Poppit! HD especially since Poppit! Is one of Pogo’s fan favorite originals? It’s almost…epic, in a sense. Pogo Terry: It is epic! I feel the studio felt it was in good hands. I have previously worked on rehabbing old classics before such as SEGA’s Sonic the Hedgehog and other iconic games from my previous work before coming to Pogo. So when I was handed Pogo’s flagship title Poppit!, I was honestly humbled and honored to take it on. Our wonderful team on Poppit! HD put a lot of love into updating this game and we wanted to make sure that it’s done right, with the respect that this Pogo classic deserves. Pogo Llama: What’s your most favorite feature/part of the new Poppit! HD? Pogo Terry: That’s a tough one to answer. I really want to say all of it. It’s such a beautiful, vibrant, colorful game and I enjoy just looking at it! I can’t wait for Poppit! fans to enjoy it all over again. Especially all new themes they can unlock ranking up! Pogo Llama: Thank you so much for joining us, Pogo Terry. I really appreciate it. Pogoians, I cannot wait for you to try Poppit! HD on Thursday. Q. Will Word Whomp and Poppit! be replaced in the Tournaments? A. Word Whomp HD, Poppit! HD and other Flash-turned-HD games will not continue to be in the current version of Pogo’s Tournaments. I do not have any further information on Tournaments at this time, but when I do, I’ll let you all know right here in the Pogo Insider. Thanks again to Pogo Terry for sitting down with us for a little Q&A about Poppit! HD. Guess what? Tumble Bees is coming our way on October 9 and he’s going to join me in the Pogo Insider studios again to take your questions. So, Pogoians, what questions do you have for Tumble Bees HD? Comment below with your questions for Pogo Terry about Tumble Bees HD. Thanks to all who took the poll regarding what is your favorite Garden in Solitaire Gardens. I voted for Farmyard Garden and I’m happy to see it tied for 2nd with Hawaiian Garden with English Garden coming in first. Have a great week ahead of you here in Pogo! What Badge Challenges do you have lineup for yourself this week? Take good care of yourself and remember you matter. I’m a dedicated Mac user – 27″ iMac desktop, 17″ iMac laptop, iPad, iPhone, blah, blah, blah. IMHO, Pogo/EA doesn’t do much to support Mac users. Example: I have never received tokens for Crossword HD. I’ve had phone conversations with Pogo Help and EA Help, both twice now, and been told each time that the problem has been fixed. Not!! At least I can now get credit for challenges, but for submitting a finished game? Not happening, dangnabbit. How many times do I have to contact support to get this truly fixed? I love Macs. I use a Mac at home (and a PC at work so I’m well balance with the tech situations at Pogo). So first off, there are not any tokens in Crossword Cove HD. We are not implementing tokens in the HD games as we’re developing a new reward system. If you’d like to see what Pogo supports on the technical side of things, please click this link. Thank you. Yes, the Pogo Community will absolutely help you with this and I’m glad you asked here in the blog. One of Pogo’s Forum Moderators created a how-to post in the forums awhile ago. If you click here, you will be taken to that how-to and it’ll help you change the score level in Jungle Gin. Thanks again for asking and let me know if you have any further questions. Hi ..I wont be able to finish all those badges in time but i will sometime ….BUT i am sooo happy that Mahjong Safari is changing .so looking forward to it …..Thanks……. So so happy to see that the new Poppit HD looks like the old Poppit and that your artists didn’t change the look of classic Spike! Thank you for not changing the game! I’m also glad to see that this game, unlike other HD games, moves fast and is not all slugish. My only concern is about the difficulty levels. The original Poppit would award more or less “rank points” based on the difficulty level. Easy gave 1 rank point, Medium 2 rank points and Hard 3 rank points. The new HD version awards only one rank point regardless of the difficulty level you play. Now that the tokens or High Scores are not an incentive to play why would someone choose to play “Hard level” if we don’t even get more rank points as a reward for doing it? Thank you for your feedback! So glad you’re enjoying the game. I have relayed the rank points to the team as I have seen it being discussed by some players. The new Poppit! HD plays nice and snappy! The response time is much quicker than the Flash version. I do though have a problem sometimes seeing the prize boxes within the balloons in Poppit! HD. Maybe the prize box line art can be darkened. Both my laptop screens and add-on monitors have “time of day” and anti-glare (surrounding brightness) sensing and auto adjust accordingly. So, at night without much surrounding light is the best scenario for me to see the prize boxes within the balloons in Poppit! HD. Thank you for your feedback and for explaining the issue you are experiencing with the balloons in Poppit! HD. I hadn’t thought of that and will let the team know. Our team won a gold in Poppit but we received no credit for this. It is my understanding that Poppit was going to be converted to HD after that tournament ended. If credit was not going to be given, why was the game left in the tournament? Thanks for reporting this. I’ll let the Pogo team know. I would like to say thank you so much for keeping us updated with what’s been going on. I’ve been a member for 10 years now and time flies when you’re having fun. I’m enjoying all the games while having fun as well! Thank you, PinkFlowerlemon! I really appreciate your positive attitude and for letting me know how you’re enjoying it. Thanks for being a part of Pogo. Thanks for letting me know. I’ve let the team know about it. Thanks! Unfortunately I’m unable to troubleshoot from the blog. Have you tried going here for loading help or contacting Pogo’s customer support? I do encourage that as those options will help you solve the issue. Pogo Llama, I have a question, since Pogo is keeping Scrabble would it be possible to update the dictionary. There are so many words that are just not in the one available. For one, the word “internet” won’t play and it is definitely a word. Also, i ask because Scrabble just udated their dictionary and added a bunch of 2 letter words like OK. Please pass it on so we can enjoy scrabble so much more when we can play new words. Thanks for the suggestion and I will pass it along.